After breakfast and another game drive, we make our way to the Itala Game Reserve, arriving at Ntshondwe Camp in time for lunch. Ithala is an ideal haven for a large variety of birds and animals. Ithala's big game species include elephant, white and black rhino, buffalo with giraffe fairly numerous, consequently chosen as Ithala Game Reserve's logo. The absence of lion makes for a relaxed air amongst the wildlife, such as the zebra and a wide variety of antelope. These include impala, blue wildebeest oribi, red hartebeest, eland, kudu, waterbuck, tsessebe, common and mountain reedbuck, steenbuck and grey duiker. Predators which are present but not often seen are leopard, caracal, spotted and brown hyena and the termite eating aardwolf. Breakfast and then we make our way north to the Nkomazi Private Game Reserve, arriving in time for lunch and your afternoon/evening game drive in 'open Safari vehicles'. The Nkomazi Game Reserve has a very wide diversity of species - including lion. The Komati Tented Lodge is 'Out of Africa' styled luxury tented accommodation with five star amenities on offer. Each tent has an extra large king-size bed, cooling or heating, an en-suite shower, a vintage outdoor bath on the private expansive teak sun deck with a plunge pool. What about a treatment at the River Retreat Spa (own account) to rejuvenate and relax. Nature lovers will be able to share in the many wonders of Nkomazi - its diversity of wildlife, habitat, along with its natural scenic splendour and interesting geological features. The Game Reserve represents a range of Africa's biomes, able to support wildlife suited to the high-lying grasslands and those that prefer the low-lying bushveld areas. 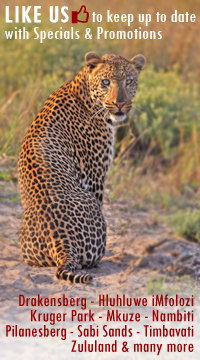 Game viewing is carried out early mornings and late afternoons into the evening, guided by experienced rangers. Traversing through the reserve, the wildlife is interesting in its wide diversity. The game drives last 3 - 4 hours, with a coffee stop in the morning and a sundowner drink stop, normally at a vantage point overlooking one of the many beautiful vistas, at sunset. The night drives are normally conducted en route back to the lodge after the afternoon game drive, where the focus shifts to the nocturnal species, sought out with the use of a spotlight. It is always advisable to take a hat and warm clothing, even in summer, layering is the answer. In winter, a warm jacket, beanie, scarf and gloves are recommended. Between the meals and guided game drives, your time can be spent reading, enjoying Spa relaxation treatments, sun-bathing, swimming and indulging in the wholesome Lodge cuisine. Nature lovers will be able to share in the many wonders of Nkomazi - its diversity of wildlife, habitat, along with its natural scenic splendour and interesting geological features. The Game Reserve represents a range of Africa’s biomes, able to support wildlife suited to the high-lying grasslands and those that prefer the low-lying bushveld areas. Game viewing is carried out early mornings and late afternoons into the evening, guided by experienced rangers. Traversing through the reserve, the wildlife is interesting in its wide diversity. The game drives last 3 - 4 hours, with a coffee stop in the morning and a sundowner drink stop, normally at a vantage point overlooking one of the many beautiful vistas, at sunset.